Available in 4 x 6pack boxes, or master-case of 48 x 6's, (total 288 condoms). TROJAN SUPRA® Lubricated Condoms are ultra thin polyurethane condoms for ultimate sensual pleasure – recommended for latex sensitive people. 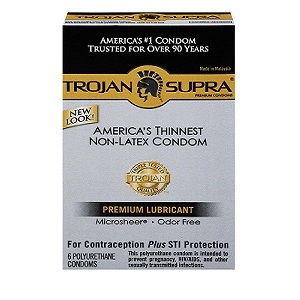 TROJAN SUPRA® brand condoms contain no latex allergens and are designed to transmit natural body heat. They are ultra thin, yet strong and made from clear, odor free, medical-grade polyurethane. NOT AVAILABLE - CALL US FOR DETAILS!